June. When my New Year resolutions finally take their last breath. When nights slowly and sneakily start taking over days, a little more every day. The “Where the hell did half the year go!” month. The month when I turn another year older (and hopefully wiser.) Amid this midyear crises, I re-evaluate my amusing goals and silly dreams. And I make ridiculous resolutions all over again. In other news, I wanted to confess about my short-term relation ship with songs. I like a lot of different types of music. Any song that makes me feel good goes into my playlist. 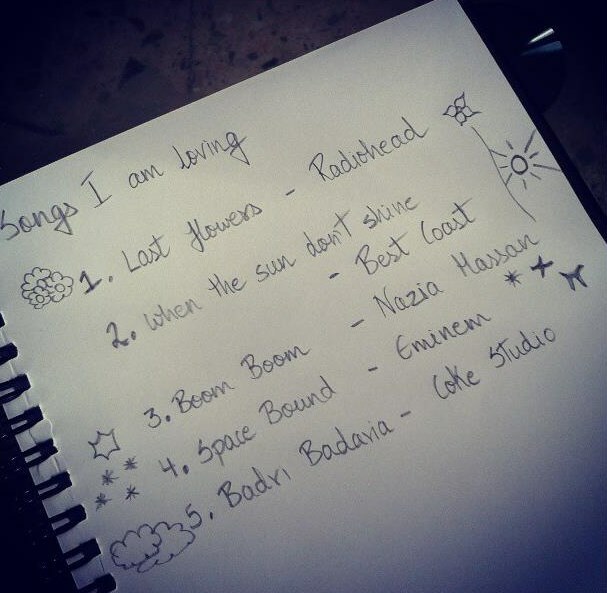 Here are the songs that I am currently listening to. But I get over songs like Ted gets over his ex-girlfriends. I am always on the lookout for new music that stirs me. And by new I don’t mean the latest, I mean a song that I am hearing for the first time. Oh and btw, it's my birthday today. So......what song makes you hit the loop button nowadays? PS: I have shifted to wordpress now so my updates wont reach you on GFC. happy birthday!! i'm inspired by you..i shall make new resolutions too! Haha ridiculous resolution made me chuckle! Happy birthday btw :) thank you for stopping by on my blog, i llve your blog, im soo glad you left a comment! :) youve found a new follower in me! hey ...nice blog...would you like to follow each other? Sending you best birthday wishes! Babe, both you and I are going through mid year crisis. Hope you had a lovely Birthday sweetie pie. Happy Birthday, you :) All the best and here's to a great year ahead! Btw, love the blog!